Don't let neck pain prevent you from having a sleepless night. Neck pain may cause a lot of discomfort while you are awake, but it should not keep you up all night. Just choose the Cr Contour Textured Gel-infused Memory Foam pillow, which will help ease your neck pain. The Cr Contour Texture gel-infused memory foam pillow will relieve neck pain by enabling the muscles around it to fully relax. It does the same to the shoulders and back. It also promotes proper spinal alignment thanks to its ergonomic shape. This lets the user retain the shape for continued rest and support throughout the night. The Cr Contour Texture gel-infused memory foam pillow does not retain heat. 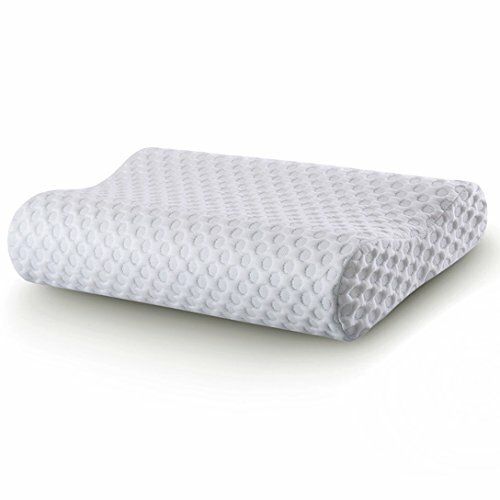 This pillow has a unique, Textured cover in addition to Aircell technology that improves airflow, help disperse body heat and ensures a cooler sleep at night. The Cr Contour Texture gel-infused memory foam pillow that is an excellent choice for side sleepers due to its contour shape. There are two lofts for choice to sleep on, low loft and high loft, you can sleep on your side. And it gives the needed support for your neck while you sleep on your side. The foam we use is CertiPUR-US certified for safety and performance, which means it does not contain any toxic ingredients like formaldehyde, methane chloride, or PBDE and provides a protective barrier against allergens such as mold, dust mites, and other bacteria. In case you experience an odor which is a "Fresh Foam" odor, it is not harmful. The odor should dissipate several days later after the pillow is unpacked and aired out. Store in a Cool and Dry Area Direct away from Sunlight. The Inner Core is Spot Clean Only with Damp Cloth. ATTENTION: DO NOT PUT FOAM IN WASHER!